Indian Rock is one of two natural arches in the region (I’ve heard the second is underwater). 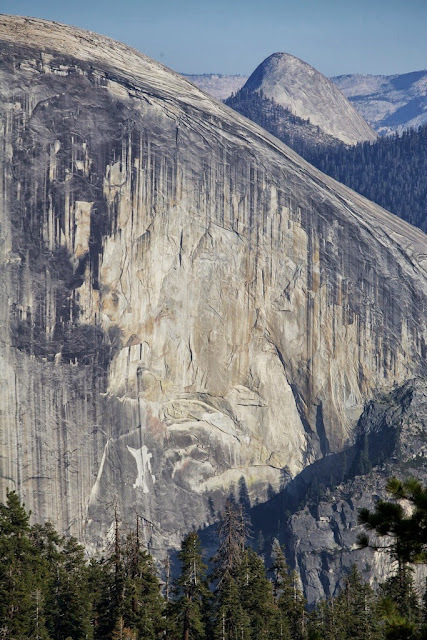 It sits on top of a steep ridge top and for those willing to scramble a bit, you can easily line up the north face of Half Dome though the arch to put the cherry on top of a splendid Yosemite hike. It is best hiked as a brief detour on the way to, or on the way back from, North Dome. 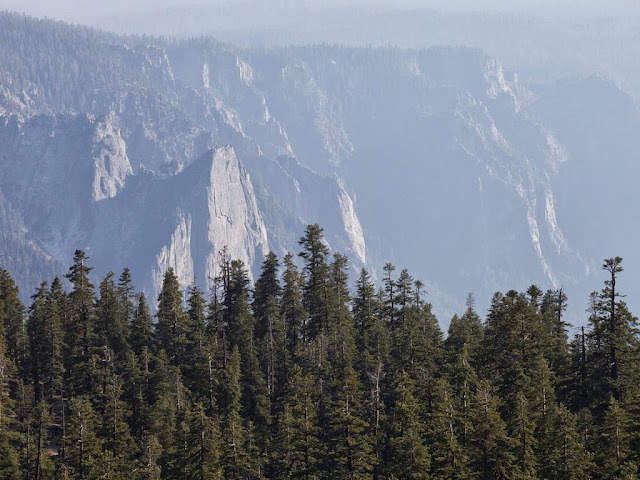 We hiked this on a summer afternoon and were not able to make it to North Dome before sundown, so this hike only describes the route to Indian Rock. 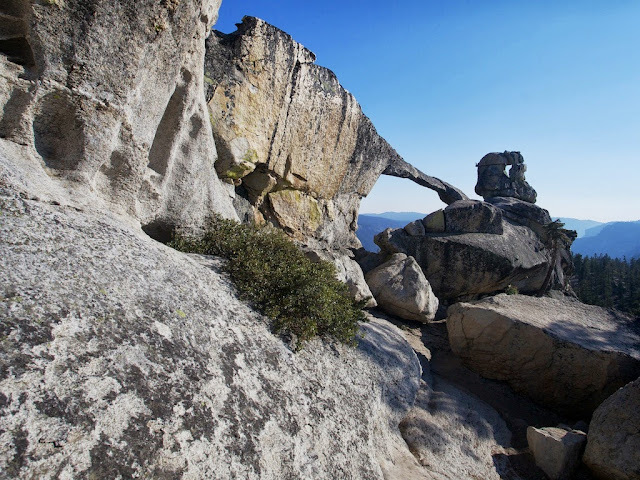 Important Note: Indian Rock may be made of granite but it is a fragile jewel of the park. Leave it how you found it, don’t climb on top of it like an idiot and treat it with the respect and reverence it deserves. It is a unique feature which took countless years to form, enjoy it, but don’t be this guy! The trail begins at Porcupine Creek Trailhead right off Highway 120, the Tioga Pass Road. That means the trail is only accessible when the road it open. The hike begins at about 8,000 feet and climbs a little bit higher. We could feel the altitude a bit at the car and we made sure to pack a little extra water. 8,000 feet is right at the cusp of where altitude begins to become a factor. The air is a little drier here but altitude sickness should not be a concern for anyone but the most out of shape hiker. The paved trail drops immediately down into a lovely pine forest and continues descending for the next half mile or so to Porcupine Creek. The creek was mostly dry on the early-August afternoon we found it. Just before hitting the creek though, a group of hikers let us know they had seen a bear just a few hundred feet up the trail. We could not decide if we should be feeling excitement or concern (we landed on a mix of the two) - however did not end up seeing that bear and only felt disappointment. After a couple miles of hiking over roughly flat terrain we hit a 4-way trail junction. We continued straight through the junction on towards North Dome. From this junction the trail climbed pretty swiftly up Indian Ridge. Near the top views deep into dome country start to open up, and by the time we reached the top we could see glimpses of the south rim of the Yosemite Valley including the Cathedral Rocks. Cathedral Rocks from Indian Ridge. At the top of the ridge North Dome comes clearly into view, only about a mile and a half off. We were already running against our turnaround time for the afternoon though. We decided to hike the 0.3 miles up to the top of the ridge and visit Indian Rock then call it a day. The trail to the top is very steep but well marked. At the top magnificent views of the north face of Half Dome started breaking through the thinning trees near the top of the ridge. We spent about 15 minutes exploring around Indian Rock itself, chatted with a lone backpacker hanging out near the rock for a few minutes, had a quick snack and then departed back for the car. 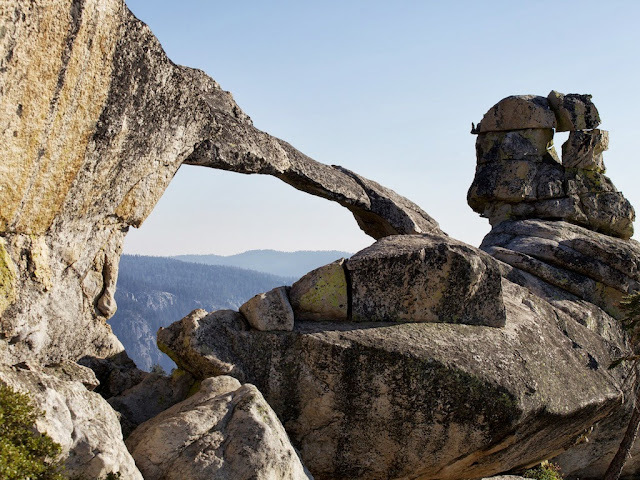 The North Face of Half Dome viewed through the arch of Indian Rock. We retraced our steps back down Indian Ridge, over Porcupine Creek and eventually back to the trailhead where our car was waiting for us right as the sun dipped below the high country domes. We spent much of the rest of the evening driving over through a Tuolumne Meadows bathed in purple and pink light, then hunting for a place to camp all over the Sierras.